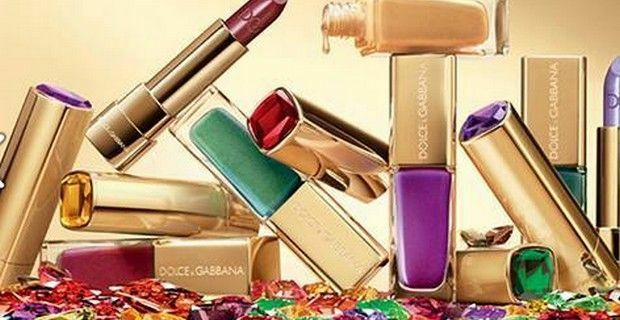 Dolce and Gabbana's latest collections have all been influenced by the stunning island of Sicily, and for this Christmas 2013 they have also launched a stunning new lip and nail beauty collection called the Sicilian Jewels . This new range of precious and elegant lip and nail colors was chosen and designed by Domenico Dolce and Stefano Gabbana in collaboration with make-up artist Pat McGrath for the holiday season. The collection is inspired by the golden Byzantine mosaics and jewellery and their Fall and Winter 2014 runways. “Matching your lipstick to your nail lacquer is a hot makeup trend. We chose four new shades that showcase the theatrical and playful side of looking good. The perfect complement to any Christmas or New Year outfit, they can be worn in a young, ironic interpretation or with a more grown-up, sophisticated vibe. Just like a piece of jewellery, ” said McGrath of the collection. This limited edition collection features jewel-toned lip and nail shades in sleek gold packaging topped with matching gemstones. Ruby, amethyst, emerald and topaz are the four gemstones and colors that D&G chose for the four unique looks that they are proposing for this winter, especially for a festive party season. The classic cream lipstick is highly glossy, and the different shades reflect the four precious stones that they represent. Ruby is a deep red that is only classic shade, while there is a deep purple (Amethyst) which is trending hue this season. Definitely the more “theatrical” side of the collection are the two avant garde shades: brilliant green (Emerald) and bright yellow (Topaz). Those who are daring enough to wear these two particular shades on their lips, also get a two-in-one bonus, as the lipsticks can also double as cream eye shadows, as McGrath pointed out. The Nail Lacquer has a slick and patent shine and the four shades match the lipsticks.